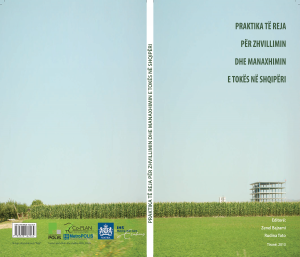 This book was published under the “Promotion of Partnerships for Common Cities” project, an initiative of Co-PLAN, Institute for Habitat Development, Tirana and IHS, Institute for Housing and Urban Development Studies, Rotterdam. The project was supported by the Dutch Government through the MATRA program. Similarly to the project, the aim of the book is essentially to build the capacity of governance institutions and professionals on addressing land development sustainably. By making use of case studies, this publication seeks to highlight the need Albania has in transitioning from plot-based to area-based land development, taking into account the surrounding context, property relations, and the rise of property value as a result of public contribution. Consequently, area-based land development takes into account, among others, the costs of providing public infrastructures, environmental costs, and the changes in property value as a result of the development. You can download the full manual here.